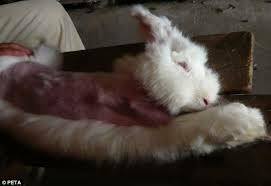 Rabbits who have their fur cut or sheared also suffer: During the cutting process, their front and back legs are tightly tethered—a terrifying experience for any prey animal—and the sharp cutting tools inevitably wound them as they struggle desperately to escape. Ninety percent of angora wool comes from China, where there are no penalties for abuse of animals on farms and no standards to regulate the treatment of the animals. When you buy a sweater, hat, or other product that contains angora, the angora wool most likely originated in China, even if the finished product was assembled elsewhere.